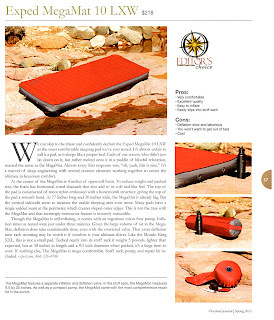 ExpedLife: Overland Journal reviews Exped MegaMat 10 - EDITOR'S CHOICE! Overland Journal reviews Exped MegaMat 10 - EDITOR'S CHOICE! "Each of our testers, who didn't just lay down on it, but rather melted onto it in a puddle of blissful relaxation, reacted the same to the MegaMat. Almost ever first response was, 'oh, yeah, this is nice.' It's a marvel of sleep engineering with several creative elements working together to create the ultimate in luxurious comfort."